The cover soil is placed over the PVC geomembrane while work continues on the other side of the pond. WASHINGTON Park in Denver, Colorado is considered to be one of city’s most beautiful parks. Additionally, the two lakes within the park are sources of water in an area of the country where water availability is a concern. Grasmere Lake was originally built in 1907 to supply water for the developing neighborhood. Discussion on how to solve this problem has gone on for several years but finally the Denver City Council, Denver Water and Denver Parks and Recreation came to an agreement on a rehabilitation plan. But Grasmere Lake has had a serious problem since it was built – it has been losing water at a rate of 100-acre feet per year of water into the ground below. That amount of water could serve the needs of 800 Washington Park homes for one year. The plan included lining the lake with a geomembrane liner system covered by soil and tied into the existing concrete bank and restoring the walking trail around the lake perimeter. As part of this restoration, the original sandstone walls were carefully removed, stockpiled and reset in a structurally sound and aesthetically pleasing manner up to the lake edge.The total cost of the park rehabilitation project was $1.6 million. A similar remedy was also implemented for Prospect Lake in Colorado, Springs, Colorado (Stark et al. 2005). concrete wall surrounding most of the perimeter of the pond. Washington Park neighborhood was originally designed by German landscape architect Reinhardt Schuetze between 1899 and 1908. His original design remains fairly intact and includes both Grasmere and Smith lakes and a lily pond. These bodies of water are fed by the “city ditch.” Washington Park consists of 165 acres of trails, flower beds and meandering paths. There are 54 flower beds throughout the park. One of the flower beds is an exact replica of Martha Washington’s garden at Mount Vernon, Virginia. Grasmere Lake is approximately 16 acres in size with a maximum depth of 10 feet. It is home to bluegills, bullhead carp, channel carp, green sunfish, large-mouth bass and yellow perch. Later landscape architects added a boat house and an evergreen grove on the north side of the park. 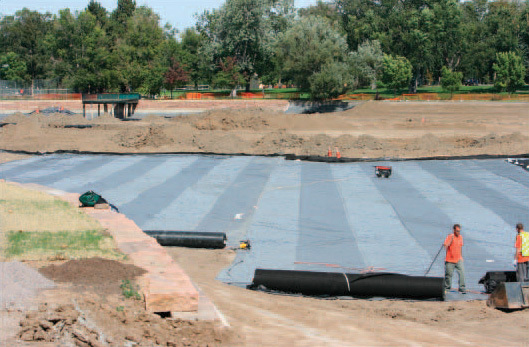 The planners decided to line Grasmere Lake with a 30-mil PVC geomembrane to reduce water loss. Construction for the entire project occurred July 19 – October 12, 2007. The general contractor for the project is American West Construction and CLI – Clear Water Construction (formerly known as Colorado Lining International) was chosen as the lining subcontractor for the project. The project was designed using a American Excelsior combination of resources from the Denver Water and Denver Parks and Recreation departments. The lake would be lined with a PVC geomembrane, covered by a protective geotextile layer and 12” of soil cover. The designer chose a PVC geomembrane because of the ease of installation and its ability to conform to an uneven subgrade. PVC geomembranes also are factory fabricated into large panels which reduces field seaming. Fifty-six pre-fabricated panels were needed for this project. Each panel was approximately 70 feet wide by 300 feet long. Factory fabrication of seams allows for the PVC geomembrane seams to be made in optimal conditions and tested prior to being sent to the field. 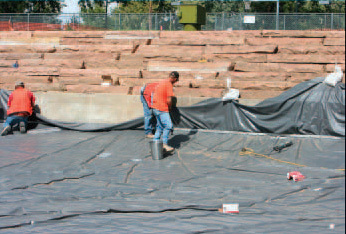 This system allows the installer to install the geomembrane much quicker than fielding seaming each roll of material together as is required with other types of geomembranes. It also costs less to install because there is less time spent in the field seaming panels together and testing and repairing the resulting seams. Installation of the 16 acres of geomembrane liner took approximately 30 days / 6 calendar weeks to complete. There was only 3000 lineal feet of field seams needed to cover 16 acres of lake area. Each field seam was welded using a dual track wedge welder and tested with air channel testing. Initially, destructive testing was conducted once per 500 lineal feet of field seam. When the destructive testing results repeatedly produced excellent shear and peel strengths, the interval for destructive testing was extended to once per 1000 feet of lineal seam. The original hardscape perimeter of sandstone rocks set on a concrete wall makes up the majority of the lake perimeter. Portions of the concrete wall had to be repaired. The PVC geomembrane was then attached to the concrete wall using aluminum batten bar attached with an anchor bolt every 6”. There was 5200 lineal feet of concrete wall surrounding the lake perimeter. Boots were also constructed around the base of the pier posts using a hot air gun and adhesives to secure the seams. 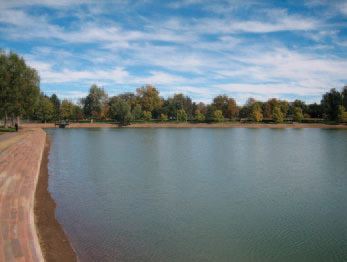 At the south end of the lake, Denver Parks and Recreation re-established wetlands during the construction of the lake. This area was left at a higher elevation to promote the growth of aquatic plants and act as a natural filter. One of the toughest challenges for this project was the limited construction equipment access and no stockpile staging area for the cover soil. Additionally, the buffer zone between the construction project and general public was tight. No vehicular traffic is allowed in the park except a short road leading to a parking lot on the north end of the park. The rest of the park had to remain open to the public while construction on the Grasmere Lake was conducted. Washington Park is a Denver city jewel. To solve the problem of a lack of a stockpile staging area, the cover soil was placed inside the pond area on one side. The PVC geomembrane and geotextile were installed on the opposite side of the pond. Once installation of the geomembrane and the geotextile was complete on the first half of the pond, then the task of moving the cover soil to the lined side of the pond had to be done. The second half of the PVC geomembrane was installed and the cover soil was placed over the entire pond. This was a time-consuming process and required close coordination between CLI-ClearWater, Denver Water, Denver Parks and American West Contracting. 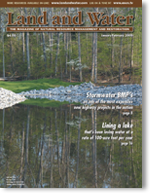 Stark, T.D., S. Slifer, G. Monley,"Saving Prospect Lake Using PVC Geomembranes," Geotechnical Fabrics Report, Industrial Fabrics Association International, Vol. 23, No. 9, December, 2005, pp. 28-33. For more iformation contact John Heap – Clear Water Construction, Denver, CO.